The RAF Museum Cosford will be holding a Remembrance Service paying respect to those Service men and women who made the ultimate sacrifice during their tours of duty. 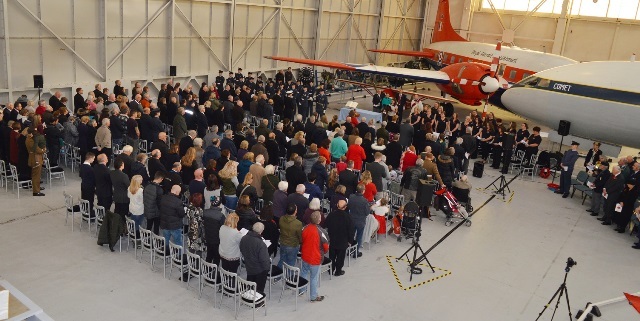 For those wishing to pay their respect, please arrive in Hangar 1 on Sunday 11 November at 10.30am. The Service will commence at 10.45am and will be led by the Station Chaplain at RAF Cosford. For this years service we have been working with a local school to create a poem for the service, the Cosford Military Wives Choir and Personnel from RAF Cosford will also be joining us. The service will include a two minute silence with the sounding of 'The Last Post'. Lest We Forget is our online exhibition which looks at Remembrance and it can be viewed here. If you would like to find out about Service Personnel who fell serving the Royal Flying Corps and the Royal Air Force during the Great War of 1914 to 1918 please visit the storyvault website.